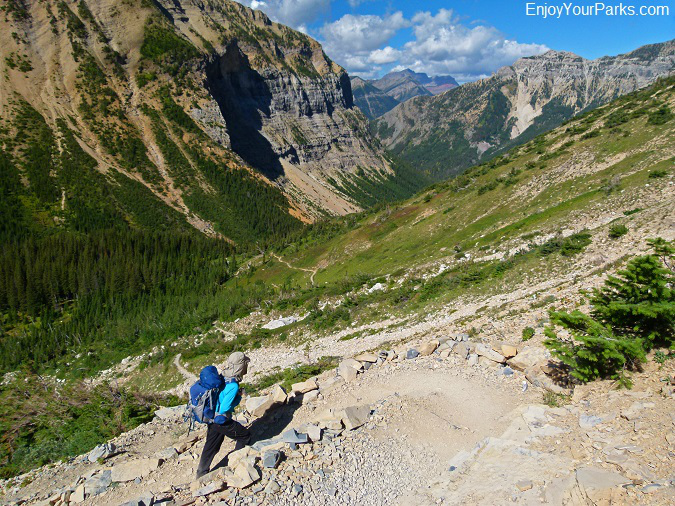 The hike to Crypt Lake along the Crypt Lake Trail is without question one of the most popular day hikes in Waterton Lakes National Park. 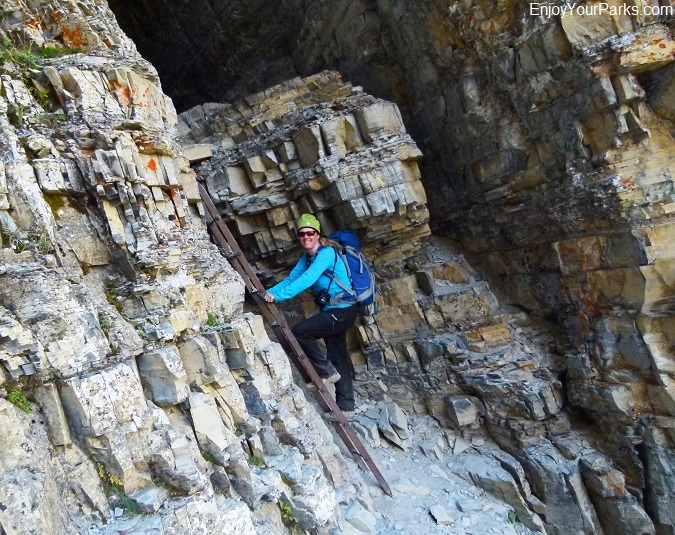 You start with a boat ride across Upper Waterton Lake, then hike by four gorgeous waterfalls, climb a steel ladder, crawl through a narrow tunnel for nearly 100 feet, and walk directly above a harrowing cliff as you hold on to a steel cable.... Now that sounds like a fun hike!!! Every time we hike the Crypt Lake Trail we completely enjoy not only the adventure of the hike, but also the incredible scenery that surrounds us the entire way. 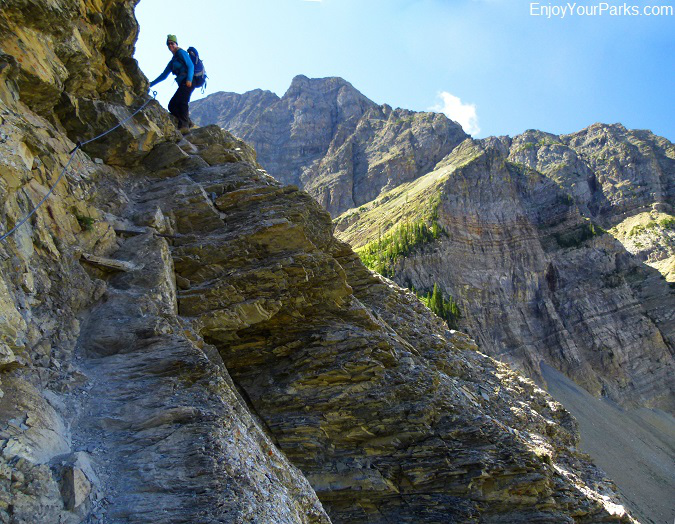 We definitely recommend the Crypt Lake Trail for anyone visiting Waterton Lakes National Park who'd love to go on a great day hike with a little bit of adventure thrown into the mix. 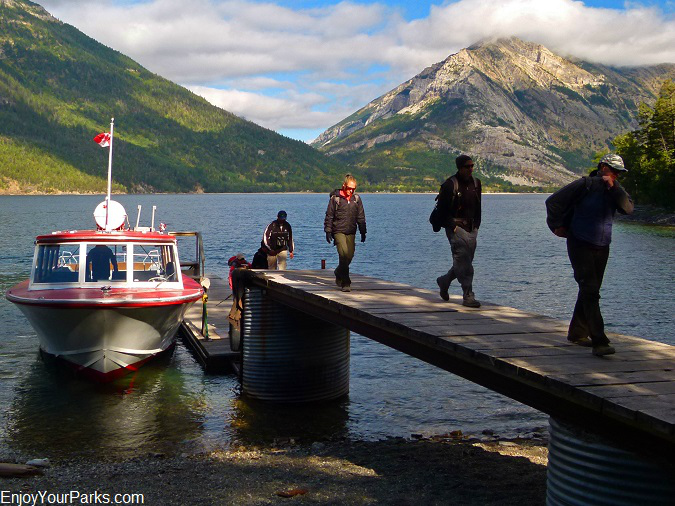 The "Miss Waterton" takes 50 hikers at a time to Crypt Landing in Waterton Lakes National Park. trailhead at Crypt Landing with 50 hikers at a time. 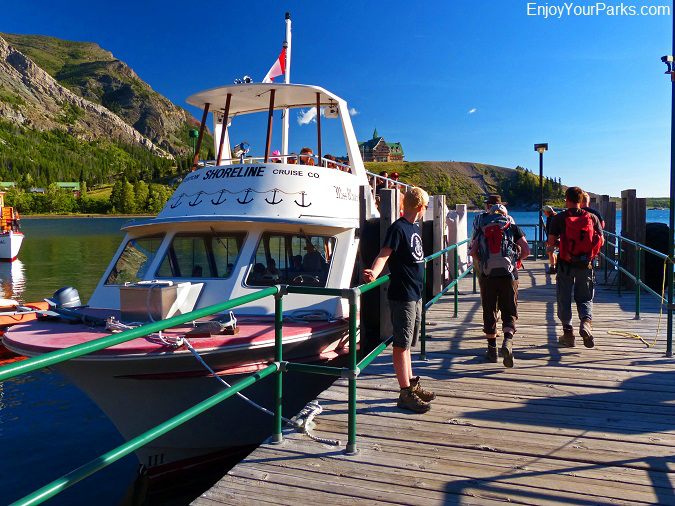 "Miss Waterton" is among the Waterton Shoreline Cruise Company's fleet of tour boats, and the boat ride to Crypt Lake begins at the Waterton Park Township boat dock. 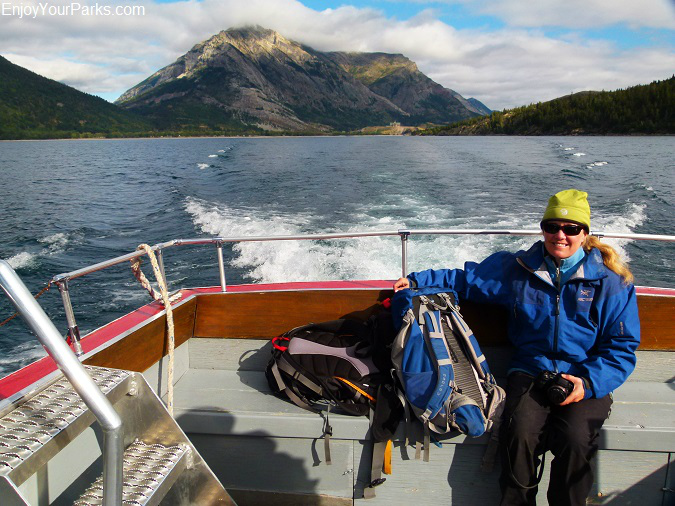 The Waterton Shoreline Cruise Company also uses a smaller boat named the "Connie Marlene" when fewer hikers are heading for Crypt Lake. Click Here for more information on this time and energy saving fifteen minute boat ride to Crypt Landing via the Waterton Shoreline Cruise Company. You can also take the Wishbone Trail to get to the Crypt Landing trailhead if you don't want to take the boat ride, but it is much farther (15+ miles), and will really eat up your day, even if you ride your mountain bike part of the way. The trailhead to the Wishbone Trail is located just beyond the Waterton Lakes National Park entrance, along the Chief Mountain International Highway. You will definitely get to know this trail if you miss your boat ride back to Waterton Park Township that evening! The "Connie Marlene" taking us to Crypt Landing, where our Crypt Lake Trail hike begins. May through last part of June: Boat departs at 10:00 am and picks up at Crypt Landing at 5:30 pm. Late June through Early September: Boat departs at 9:00 am and 10:00 am, and picks up at Crypt Landing at 4:00 pm and 5:00 pm. Early September through early October: Boat departs at 10:00 am and picks up at 5:30 pm. 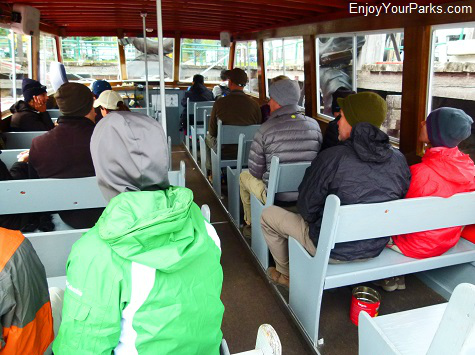 Please Click Here for the exact details, dates and prices of this boat shuttle. 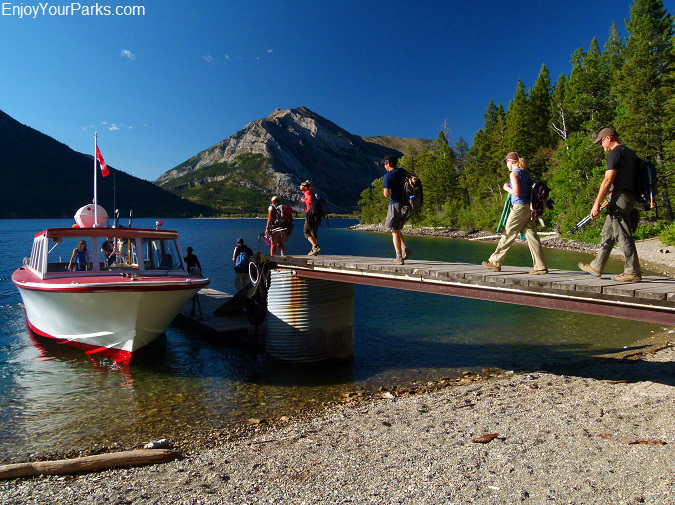 Hikers arriving at Crypt Landing on the "Connie Marlene" in Waterton Lakes National Park. sign showing you the way. There are also campsites located at Crypt Landing for those hikers on a multi-day backpacking adventure in the Crypt Lake area. Once you get off the boat, you and fifty other hikers (during peak season) will head for the Crypt Lake Trail. Stay calm and stay polite, and fairly quickly this bottle neck will straighten itself out. The faster hikers will separate from the slower hikers, and it will all work out just fine. 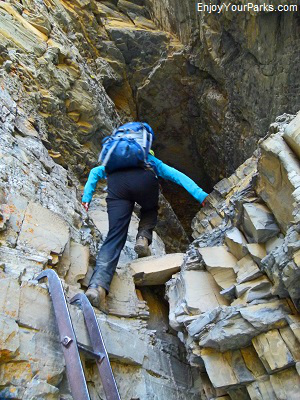 The Crypt Lake Trail in Waterton Lakes National Park climbs quite abruptly initially. 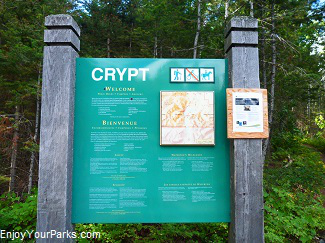 In fact, the Crypt Lake Trail climbs about 900 vertical feet in one mile. So be ready to get a little "cardio" going during this first mile of the hike. By the way, you will be hiking through fairly dense forest, so make sure you talk loud so you don't surprise a grizzly bear that may be on or near the trail. 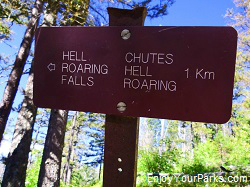 In about two tenths of a mile along the Crypt Lake Trail in Waterton Lakes National Park, you will encounter the Hellroaring Canyon Trail junction on your right. We highly recommend that you IGNORE this junction sign and continue onward towards Crypt Lake. You can take this spur trail on your way down if you'd like. 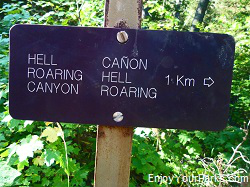 We'll talk about the Hellroaring Canyon later in this section. The trail begins to somewhat level off after the first mile, and at mile 1.4 you will encounter another Hellroaring Canyon Trail Junction. This is the junction that we recommend that you take on your way back from Crypt Lake, if you have time. But for now, once again ignore this junction and keep heading for Crypt Lake. Mount Boswell dominates the southern skyline along the Crypt Lake Trail in Waterton Lakes National Park. The trail works its way up the north slope of the Hellroaring Creek Valley all the way to Crypt Lake. 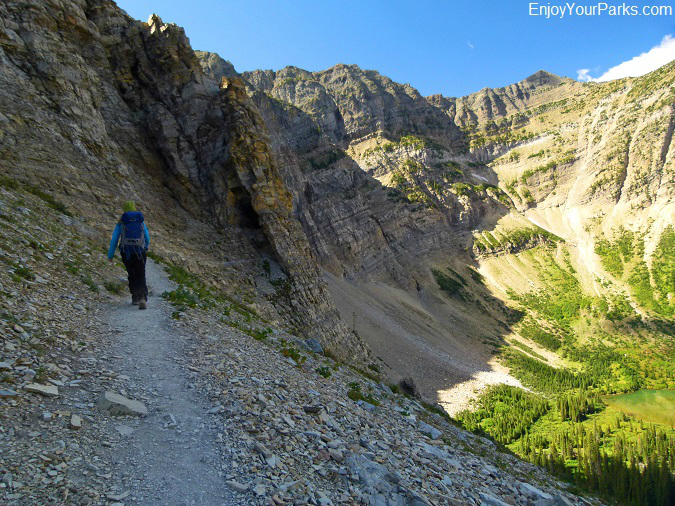 Once the Crypt Lake Trail in Waterton Lakes National Park enters the Hellroaring Creek Valley, the trail levels off nicely here, where it only climbs about 250 vertical feet in 2.5 miles. Looking back you will get really nice glimpses of the Waterton Valley to the west. 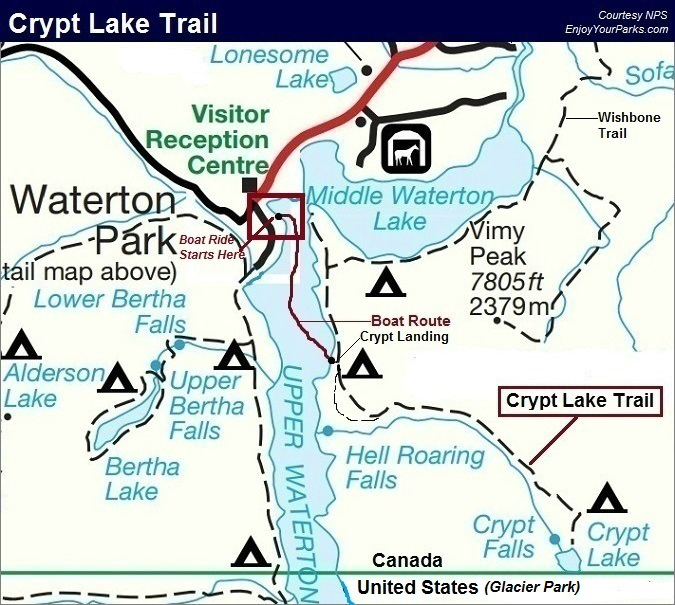 Along the Crypt Lake Trail in Waterton Lakes National Park, you will encounter a short detour to Twin Falls, about 2.1 miles from the Crypt Landing trailhead. The falls are somewhat blocked by pine trees, but are still very scenic, especially early in the summer season when the water is really pouring down due to the melting snow. 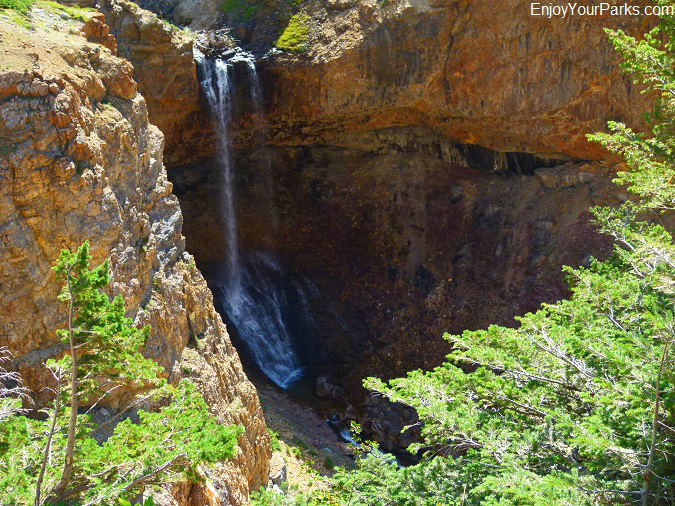 Burnt Rock Falls along the Crypt Lake Trail in Waterton Lakes National Park. We photographed these falls in early September. Earlier in the summer, there is a lot more water coming down. 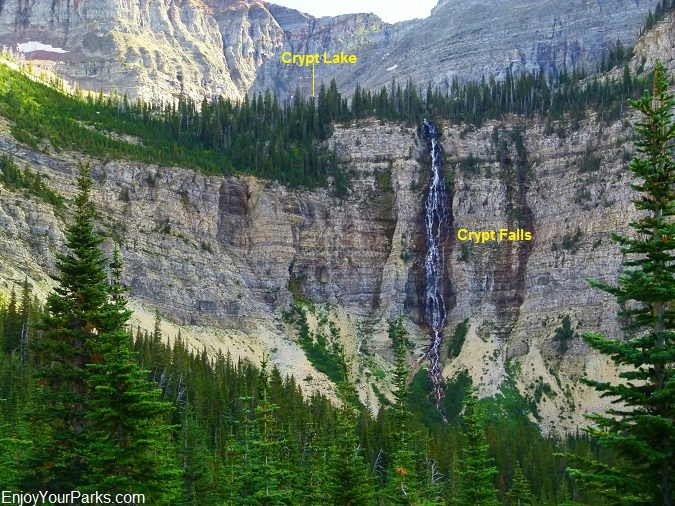 About 1.3 miles beyond Twin Falls along the Crypt Lake Trail in Waterton Lakes National Park, you will then encounter Burnt Rock Falls to your right (see photo above). Burnt Rock Falls are really beautiful, especially during the early summer season when Hellroaring Creek is really high because of the spring run-off. These falls are located in a rocky "bowl", where the sound of the falls is amplified. This particular hike where we photo-documented the Crypt Lake Trail was in early September, therefore the Burnt Rock Falls weren't as impressive as they are earlier in the summer. 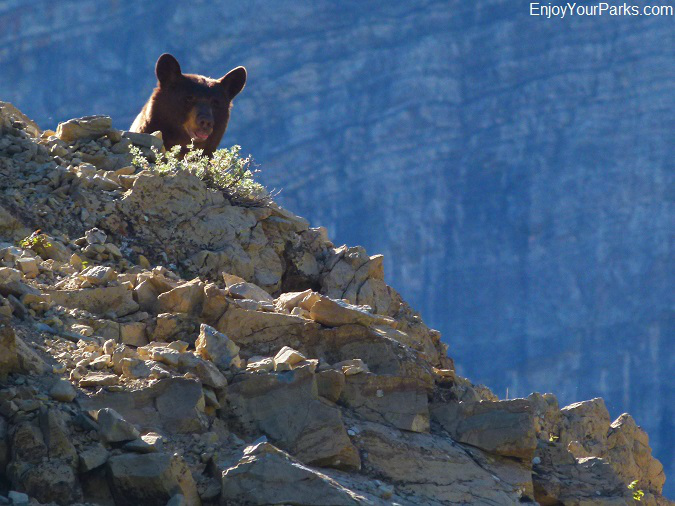 Along the Crypt Lake Trail, this black bear peeked over a ridge directly above us to see what we were. 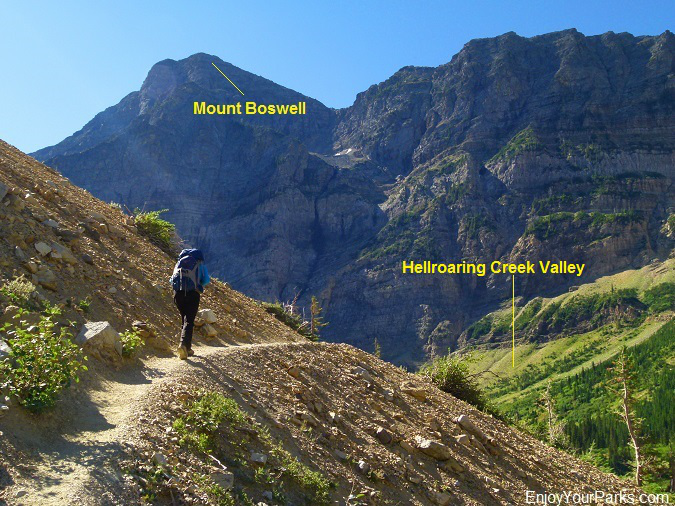 At about mile 4.0, the Crypt Lake Trail begins to rapidly gain in vertical elevation as it climbs up the north side of Hellroaring Creek Valley. There are a fair amount of switchbacks as the Crypt Lake Trail gains nearly 1,400 vertical feet in less than a mile. As you climb in elevation, the views get better and better. You will see Vimy Ridge straight to the east, and Mount Boswell will dominate the view to the southeast. Also to the east, between Vimy Ridge and Mount Boswell, you will see Crypt Falls cascading down from a large hanging valley, where Crypt Lake is waiting for you. 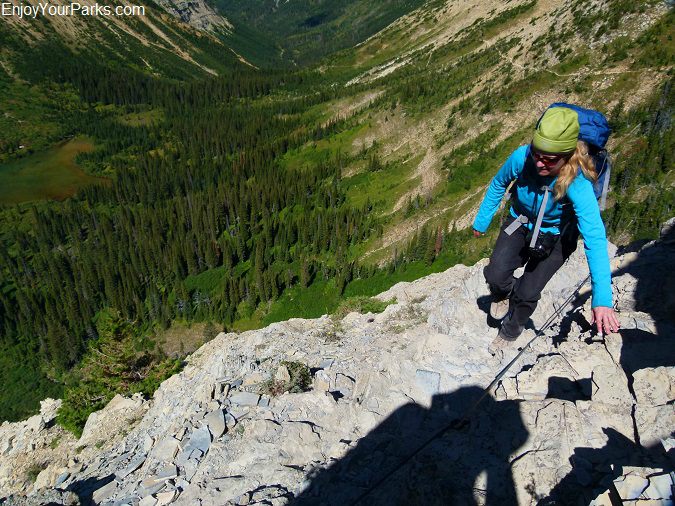 Shannon heading up the many switchbacks as the Crypt Lake Trail gains nearly 1,400 feet in less than a mile. This photo gives you a good view of the Hellroaring Creek Valley as well. As the trail works its way up the Hellroaring Creek Valley toward the east, you will begin to see Crypt Falls in front of you. Located at what is known as the Hellroaring Creek Valley Headwall, Crypt Falls is 500 feet tall, and during the early summer season, they are incredibly impressive as tons of water pour down these amazing falls due to all the snow melting above it. 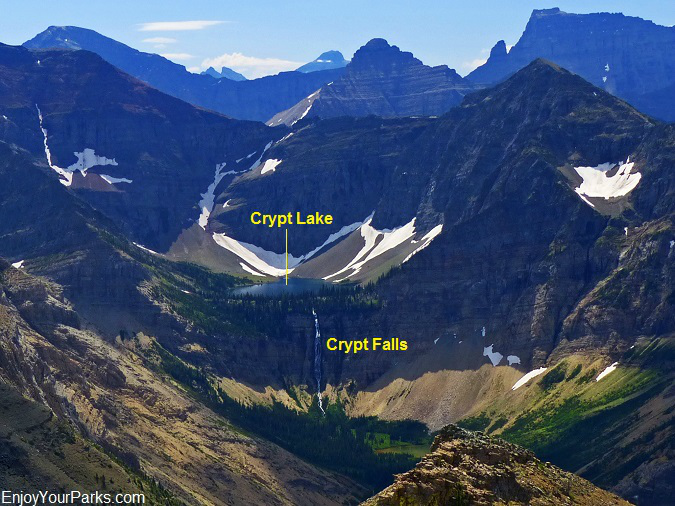 Crypt Lake rests in the "hanging valley" above this giant headwall in Waterton Lakes National Park. This hanging valley was created by two glaciers flowing perpendicular to each other. As you get closer to the Hellroaring Creek Valley Headwall, you will begin to get good views of Crypt Falls. We took this photo in early September. Earlier in the summer, Crypt Falls are much more impressive due to all the water pouring down from the melting snow above the falls. As you get closer to the Crypt Lake Campground, you will get this nice view of Crypt Falls, as well as the Crypt Lake Tunnel and the hanging valley where Crypt Lake is located. As the Crypt Lake Trail continues to gain in elevation, you will see a emerald colored glacial tarn (lake) below Crypt Falls to your right. This small lake located on the floor of the Hellroaring Creek Valley, this small lake is getting smaller through the years as it is slowly filling up with silt from the erosion taking place above it. Mount Boswell looms high above this glacial tarn to the south. At mile 4.8 you will reach the Crypt Lake Campground, which is just north of this glacial tarn. The Crypt Lake Trail then levels off again as it approaches the Crypt Lake Tunnel (see photo below). 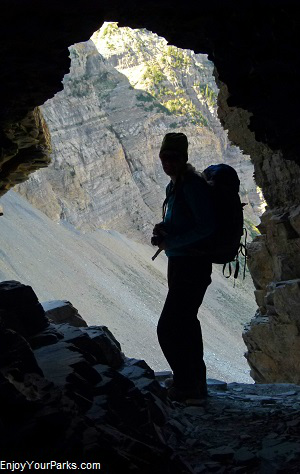 Shannon heading for the Crypt Lake Tunnel along the Crypt Lake Trail in Waterton Lakes National Park. 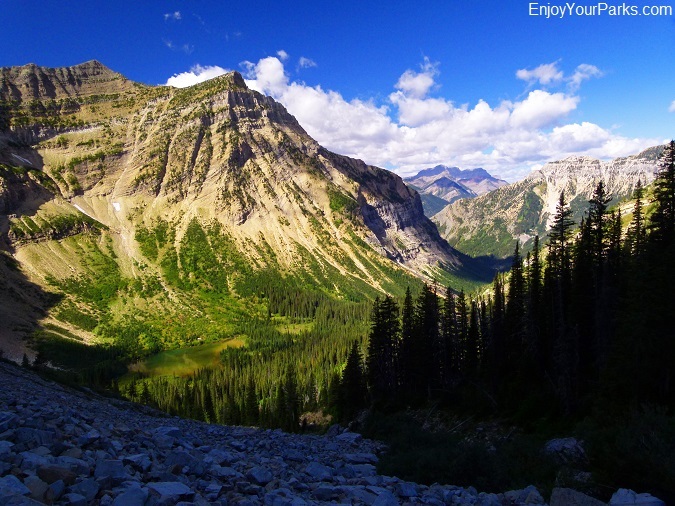 Just before you get to the Crypt Lake Tunnel, you will get a great view of Mount Boswell and the Hellroaring Creek Valley in Waterton Lakes National Park. 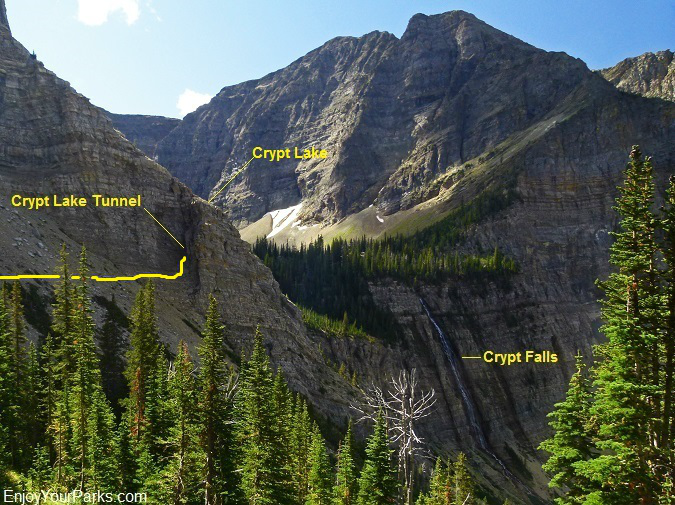 The Crypt Lake Tunnel is one of the most entertaining sections of the Crypt Lake Trail in Waterton Lakes Park. This steel ladder takes you up into the Crypt Lake Tunnel. Ridge onto an open rock slide area, just to the north of Crypt Falls. As the trail gets closer and closer to an outcropping cliff, you will notice that the trail seems to disappear into the cliff. Well, actually it does. As you reach this cliff (which is about 0.3 miles from the Crypt Lake Campground, you will find a steel ladder bolted into the cliff that takes you up into the opening of a small tunnel that takes you through literally inside of this huge rock wall. The Crypt Lake Tunnel is only about 4 feet high at the most, and is quite narrow in places. We really enjoy crawling through this interesting tunnel, and no matter how many times we've done it, we never tire of it. After crawling for nearly 100 feet, you will reach the other end of the tunnel. 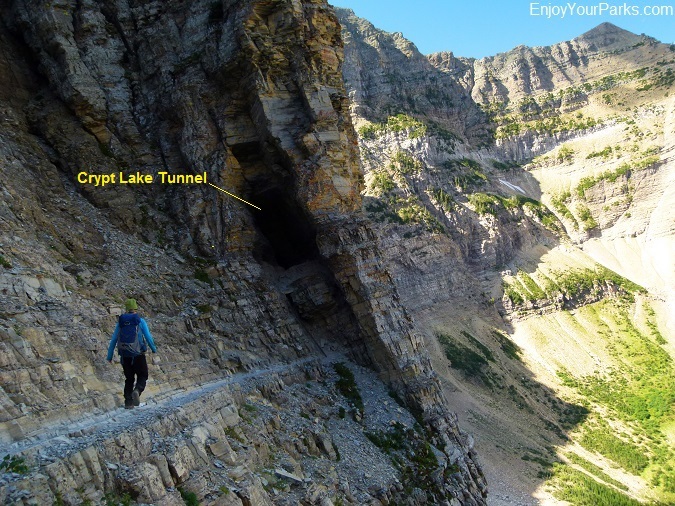 The Crypt Lake Tunnel is one of the most entertaining sections of the Crypt Lake Trail hike in Waterton Lakes National Park. However, this is also where there can be some serious bottlenecks during the peak summer season, because not only are 50 hikers trying to go through this tunnel from the first boat, but remember there is a second boat bringing 50 more hikers an hour later. A bottleneck can definitely occur with just the first bunch of hikers, but usually by the time they reach the tunnel everyone's fairly spread out. The real potential for a whopper bottleneck is when the first bunch of hikers are coming back through the tunnel, and the second boat load of hikers is at the other end of the tunnel trying to get through to see Crypt Lake. And add on top of that someone who is really having a difficult time with the exposure below their feet along the section of the trail just beyond the tunnel...that's when things can get really backed up. If this happens, just stay calm... it will work itself out. The Crypt Lake Tunnel in Waterton Lakes National Park is about a hundred feet long, and only about four feet high. In places it gets quite narrow, and to be honest with you, it's an absolute blast to crawl through!!! Once you've made it through the tunnel, you will then climb downward about 10 feet, where you will then be soon be greeted by a sheer cliff directly below your feet (see below). That's what the steel cable is for. 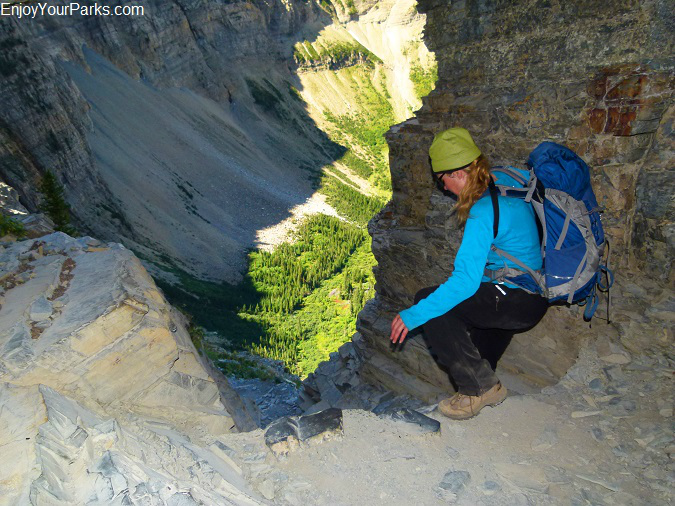 Grab onto the cable and carefully work your way along the trail above this amazing exposure. Please watch your footing during this section of the trail, and make sure your hiking poles are folded up and put away onto your backpack so you have two hands to navigate this section of the trail. If you're frightened of heights, simply don't look over the cliff. Instead, concentrate on the steel cable and your footing. We usually see a few hikers stop and turn around at this section of the trail due to their fear of heights... and all we can say is that if you're not comfortable with hiking along the edge of this cliff, then don't. But please keep in mind that the cable makes this section of the hike very safe and far less "scary" than if you were on your own here. The steel cable makes this section of the Crypt Lake Trail quite safe, but for those hikers who have never experienced this type of exposure, it definitely gets their attention! 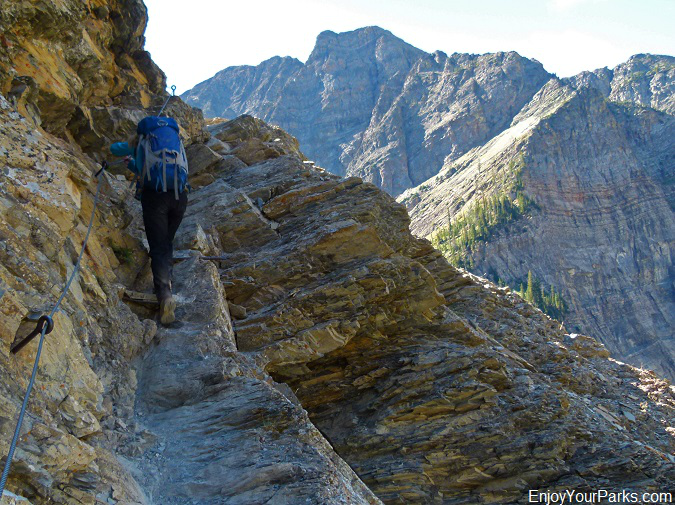 This section of the trail is the final "adventure" before reaching Crypt Lake in Waterton Lakes National Park. Almost there! 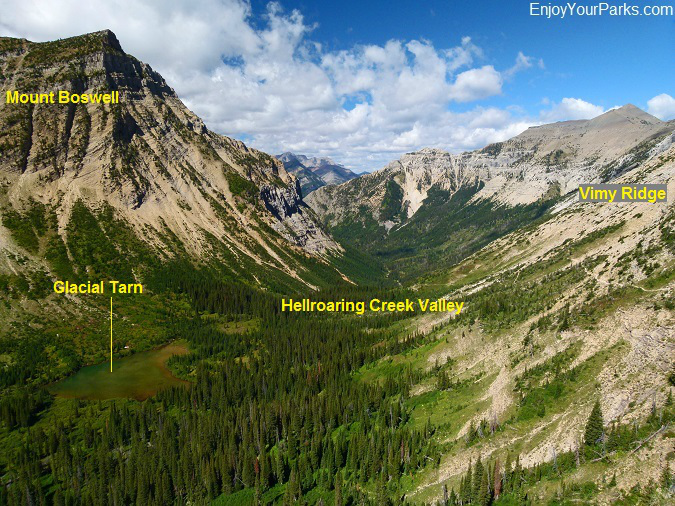 From where Shannon is standing along the Crypt Lake Trail in Waterton Lakes National Park, there is a great view of the Hellroaring Creek Valley to the west (see photo below). This is a classic view of the Hellroaring Creek Valley from the top of the "Steel Cable Section" of the hike to Crypt Lake in Waterton Lakes National Park. You can see the Crypt Lake Trail on the Vimy Ridge slope to the right. 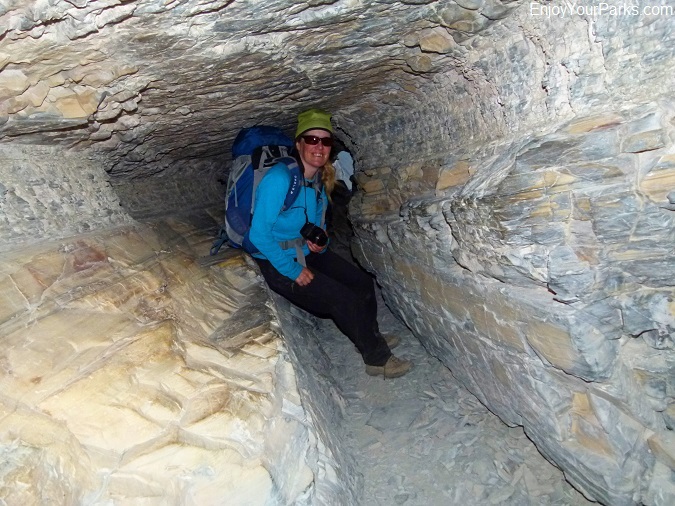 Once you've made it past this exposed section of the Crypt Lake Trail, you've now got it made. The trail will then take you through a gorgeous forested bench as it works its way up to Crypt Lake, which is only about a third of a mile beyond the tunnel. 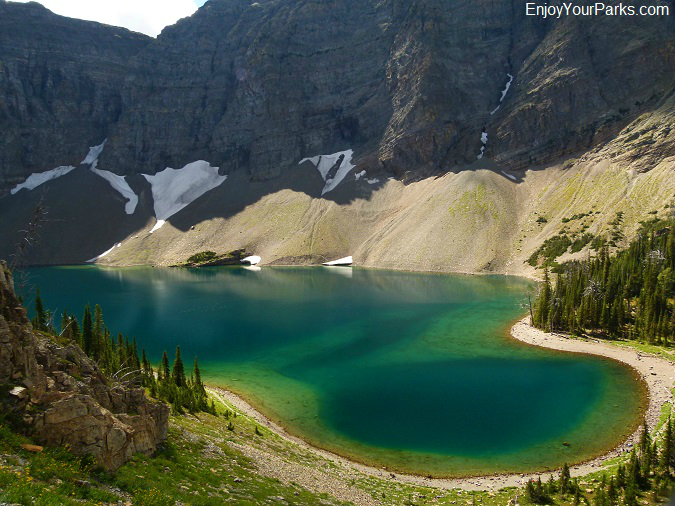 Crypt Lake is a beautiful mountain lake that rests in a type of cirque known as a "hanging valley". Crypt Lake in Waterton Lakes National Park. 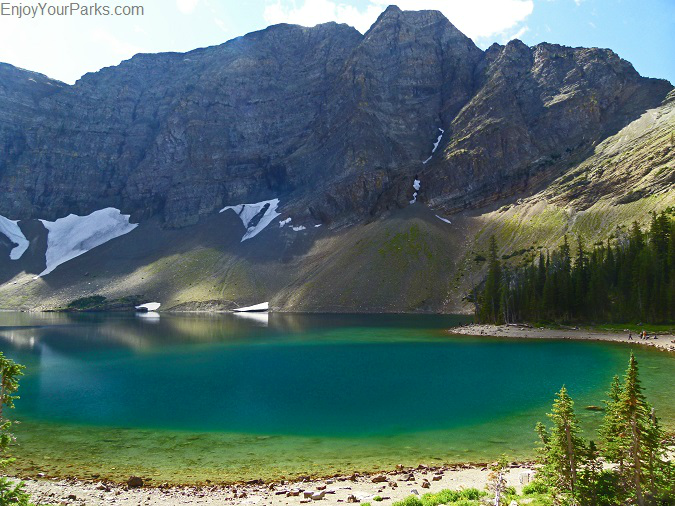 Crypt Lake is a beautiful high mountain lake nestled in a type of cirque known as a "hanging valley". This was caused by two glaciers heading in opposite directions. There are tremendous walls surrounding Crypt Lake, and it really makes for a breathtaking photo session. Once you've taken a bunch of photos, the west and north shores of Crypt Lake have many great places to enjoy a nice lunch while you take in all the beauty that surrounds you. Another view of Crypt Lake in Waterton Lakes National Park. 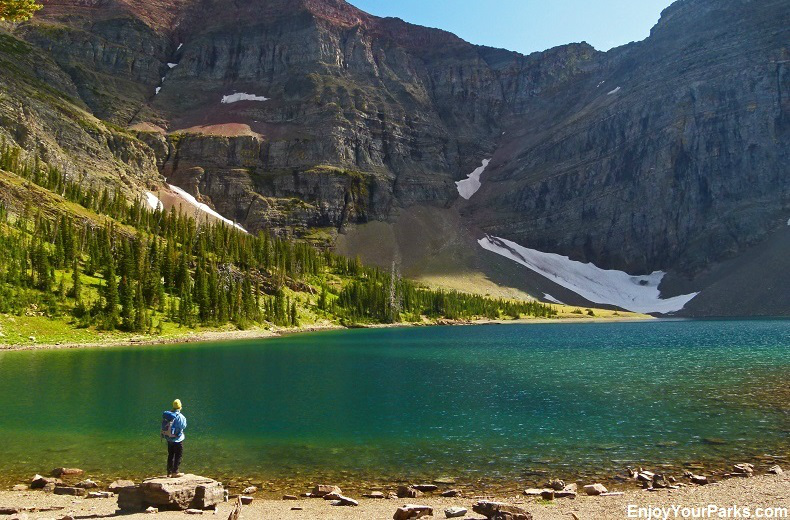 The mountain that you rising up from the south shore of Crypt Lake in this photo is actually in Glacier National Park, Montana. The mountains that surround Crypt Lake are part of the Wilson Range, which is a mountain range shared by both Waterton Lakes National Park in Canada and Glacier National Park in the United States. In fact, just beyond the south shore of Crypt Lake is the International Boundary. 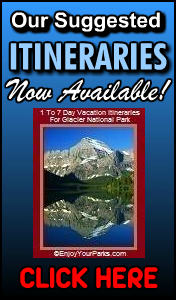 Therefore, the mountains looming over Crypt Lake to the south are actually in Glacier National Park, Montana. We've seen hikers during the early part of the summer walk along the large snow fields that wrap around the lake and actually step foot in the United States. There of course are no border patrol agents here because if you wanted to get any further into Montana, you'd have to be an expert rock climber to do so. 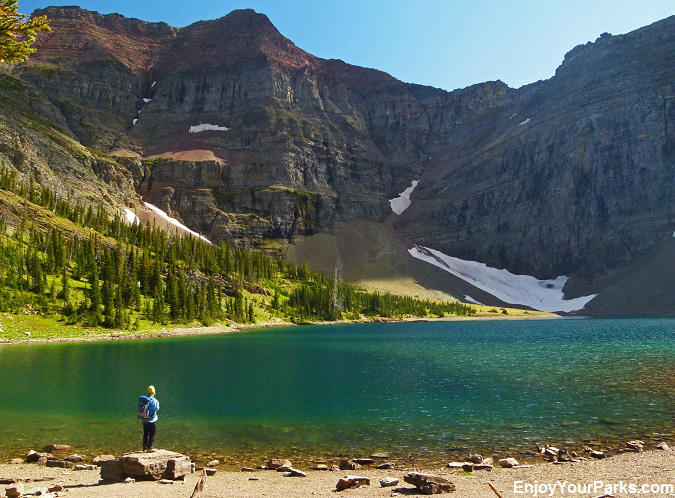 The mountain that you see in this photo is actually in Glacier National Park, Montana. The International Boundary is just beyond the south shore of Crypt Lake, at the base of this mountain. If you took the boat to get to Crypt Landing, you need to get back to Crypt Landing to catch the boat back. If you miss the boat, you will have to hike all the way back along the Wishbone Trail, and then walk back along the highway several miles back to Waterton Park Township. If you have to do this, you won't be a happy camper. So make sure you get back on time... that's all we can tell you. going trail, is more primitive, and it drops dramatically in elevation as it works its way to Hellroaring Falls. Is it worth the effort? If you think you have time, the hike is quite nice, and the falls are interesting but not life changing. It will probably take you about a half hour to 45 minutes longer to get to the boat as opposed to simply staying on the main Crypt Lake Trail. So if you have time, and you're not taking the risk of missing the boat (literally), then go for it. 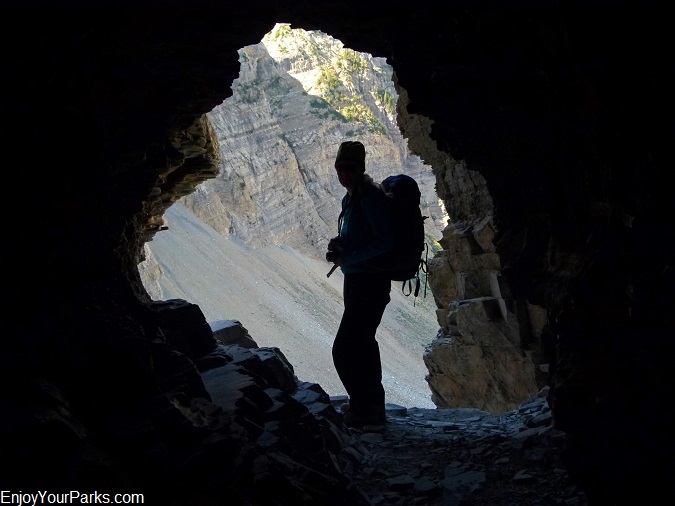 We've been on this spur trail several times, and we feel Hellroaring Canyon is definitely NOT the highlight of the Crypt Lake experience, but if you have time you might as well check it out for yourself. If you skip it, it doesn't detract from your Crypt Lake Trail adventure... You didn't miss anything that is more amazing than what you experienced on the Crypt Lake Trail. off all at once at Crypt Landing. This can create quite a bottle neck initially as the faster hikers work their way past the slower hikers. This will definitely eat up some time. And another section of the trail where you may get into another "bottle neck" is the tunnel. We've had to wait quite awhile at times to get through the tunnel and get past the trail section that has a cable as hikers hike directly above a sheer cliff. This is where some hikers really have some difficulties, and will create a "hiker jam". When this happens, all you can do is stay calm and wait. This of course can happen on the way up AND on the way down, so keep this in mind when you're eating lunch at Crypt Lake... you may not have as much time as you think! Another interesting phenomena occurs at the tunnel. Remember that during the peak summer season, there are two boats with 50 hikers each, about an hour apart. We've seen it where the hikers on the first boat are coming back to the tunnel, and they meet up with a large group of hikers coming up from the second boat. This also can cause a "hiker jam" that will eat up your time. If you don't like hiking with a lot of other people around you, you may not want to take the Crypt Lake Hike during the peak season. It's a great hike, but we want to give you the honest "heads up" so you're aware of this reality. We enjoy the Crypt Lake Trail after the first few days of September, following the 3 day holiday... that's then there are far less hikers taking the boat ride, and there are no early season snow issues. We HIGHLY recommend that you bring a water filter rather than carrying your own water. Water is really heavy, and you'll probably not haul enough with you to stay properly hydrated. So bring a portable water pump/filter such as the Hiker Pro by Katadyn and a Nalgene bottle. This will make the hike to Crypt Lake (and every hike you ever gone in the future) much, much more enjoyable. Back to the boat after a terrific day on the Crypt Lake Trail! This is a view of Crypt Lake from the Summit of Vimy Peak in Waterton Lakes National Park.